Royal Philips said Tuesday it is co-locating researchers from its Philips Intellispace Genomics team within the Valhalla, NY, campus of New York Medical College (NYMC), in an expansion of the personalized cancer care collaboration between the college and the company’s Healthcare Research unit. About a dozen Philips researchers are working from BioInc@NYMC, the biotechnology incubator of NYMC, which collaborated with Philips in creating the Philips IntelliSpace Genomics solution for oncology genomics. Philips Healthcare Research will anchor BioInc@NYMC—which has attracted 10 mostly startup business tenants since opening two years ago—in a building formerly occupied by the American Health Foundation. “We have located here our R&D team, composed of researchers, developers, the business development people. 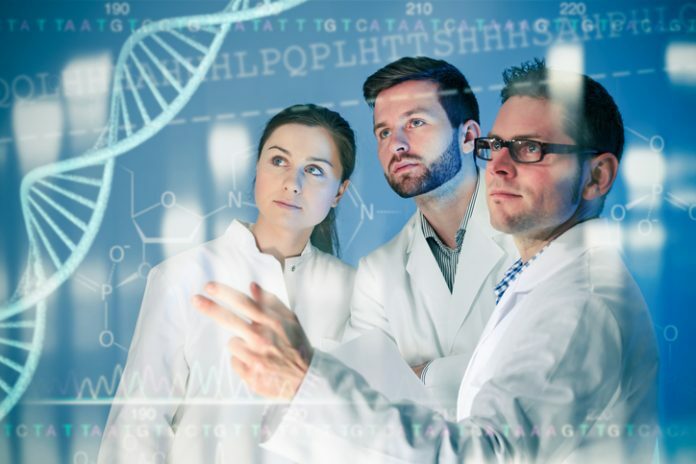 They are responsible for doing work in genomics, to try to bring genomics and other information together to bear on patient care,” Hans-Aloys Wischmann, Ph.D., head of Philips Research Americas, told Clinical OMICs. Dr. Wischmann was among executives of Philips who joined NYMC administrators and local dignitaries in celebrating the expansion of the partnership at a ceremonial ribbon-cutting Tuesday at BioInc@NYMC. From a single research project, Dr. Wischmann said, the Philips-NYMC collaboration has grown to five projects and the co-creation of Philips IntelliSpace Genomics. The cloud-based platform is designed to enable physicians and specialists to plan individualized therapies at the point-of-care, by integrating clinical expertise with collaborative computational genomics involving large data sets. “It’s our first foray into computational genomics. We have a sequence of things that we want to do in this space,” Dr. Wischmann said. He said the team is working with NYMC to develop other computational genomics solutions including a partnership to develop innovations designed to address society’s most pressing healthcare challenges—and deliver on Philips’ public commitment to improve the lives of three billion people by 2025. IntelliSpace Genomics is built on Philips HealthSuite, a cloud-enabled connected health ecosystem of devices, apps and digital tools that enables the platform to bring together data from multiple sources. Those sources include raw sequencing data, up-to-date in silico genomic databases, clinical data and knowledge databases, longitudinal patient records, medical images and pathology data. “We have the clinical data as well as the genomics platform, which is very key for our healthcare solutions providers. It’s very key for hospitals. Otherwise, you have a genomics startup that’s doing the genomics interpretation, and then it’s a long haul from there to bring it to the clinic,” said Shameer Khader, Ph.D., director of bioinformatics data science and precision medicine with Philips Healthcare. Philips IntelliSpace Genomics is being applied in the personalized cancer treatment initiative launched last month by Philips and Westchester Medical Center Health Network (WCMHealth), whose namesake flagship hospital Westchester Medical Center is located near NYMC. WMCHealth was the first health system to use an enhanced version of IntelliSpace Genomics that incorporates clinical analysis, annotation and interpretation of genomics, and other relevant patient and clinical data, through a partnership with molecular clinical decision support company N-of-One.